Understanding opposites is an essential language skill for developing a higher level thinking. By mastering the concept, juniors learn to understand the relationships between objects and at the same time, improve their ability to communicate. There are actually many activities that you can use to teach kids about opposites, but here's an app that I think would make the job easier. Called You and Me: We're Opposites, this colorful storybook uses zoo animals to illustrate how some things are different than others. You and Me: We're Opposites is a storybook app that teaches the concept of opposites. You and Me: We're Opposites is adapted from a book authored by Harriet Ziefert and illustrated by Ethan Long. In this lighthearted story, various cartoon animals engage in silly antics to help juniors learn 14 pairs of everyday opposite words. In each delightfully animated page, you will find two animals that represent a pair of opposites. One animal will describe something about itself ("I'm nice!") and proceed to point out a contrasting attribute of the other ("You're grouchy!"). They also demonstrate their assigned words in a humorous fashion. In one scene, a big elephant steps on a little lizard's tail. 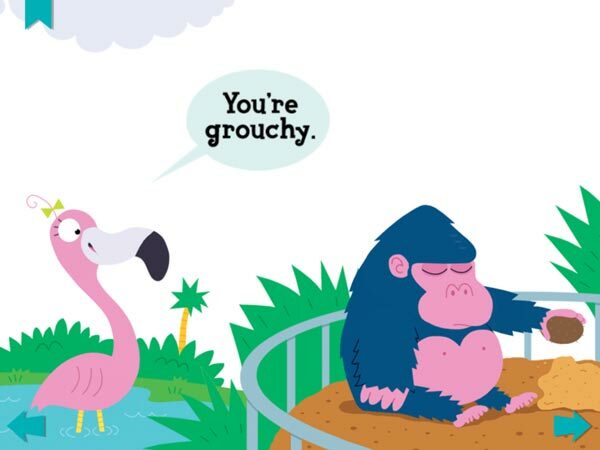 In another, a nice flamingo teases a grumpy gorilla, who responds by throwing a coconut at her. At the end of the story, there is a music video that features all 14 opposites. The lyrics to the song are displayed on screen in karaoke-style, so juniors can sing along while reinforcing the concepts taught in the book. Also included is a simple Activity in which juniors are tasked to find the correct opposite for the animals in the pen. Which animal is opposite of the slow turtle? And which is the reverse of the clean parrot? By doing this hands-on practice, juniors can test their knowledge of the opposites. The app uses cartoon zoo animals in silly situations to illustrate opposites. Designed for toddlers and preschoolers, You and Me: We're Opposites is an especially simple book that contains a maximum of four words in each page, such as "I'm tall, you're short." However, the list of opposites included is fairly diverse, covering topics like position, emotion, size, location, color and more. In addition, the app also touches on spatial concept, such as in-out, on-off and up-down. Feature-wise, the app has most of the ones commonly found in a book app. There are two reading modes: Auto Play, which plays through all the animated scenes without delay and Read to Me, which waits for the reader to manually turn the page by pressing on the left/right arrows. The Read to Me mode also contains additional animations that are triggered by pressing on the animals. The list of opposite words span over various topics like color, emotion, size, position and and location. While I still think that the animal theme is overdone, I like You and Me: We're Opposites. It's a charming app, one with a quirky sense of humor and an incredibly simple plot that is appropriate for its targeted age range. Visually, the app is lovely thanks to the use of colorful and clean-cut graphics. The animations are also really well done - simple and subtle, they do not take away from the main focus of the app which is to teach the opposites concept. As the stars of the story, the zoo animals are adorable characters that fittingly illustrate the opposites concept. They also have the surprising ability to display a variety of facial expressions like happy, sad or irritated. While it is not the main focus of the app, you can also use these to build your junior's vocabulary on emotions. Finally, the included activity and song are useful tools to reinforce the things that juniors have learned from the story. The song is my favorite part, and although it is nothing extraordinary, I like that the the lyrics are arranged in a way to encourage juniors to sing along. At the end of the story, juniors can sing along with the music video or do a mini matching activity. Overall, You and Me: We're Opposites is a delightful little app for learning the concept of opposites. While it is specially geared towards toddlers and preschoolers, I think that parents with slightly older juniors could also use this app to learn about different emotions and action words. My only complaint is that the feature to turn off narration is buggy, but otherwise it is a useful app that I would recommend.